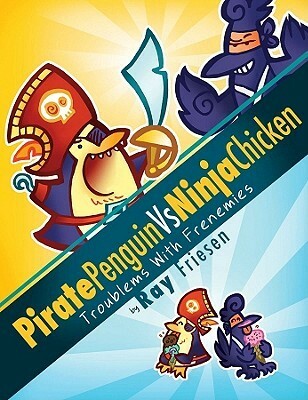 Pirate Penguin and Ninja Chicken are the perfect definition of frenemies. One minute they’re the best of friends, and then the next they’re fighting and trying to beat each other. But you can count on them having lots of fun along the way. There is something so endearing about this book, and it’s not just the charming illustrative style (which I really enjoyed). It was instant book love for me. It’s been a long time since I’ve read a book that consistently made me genuinely belly laugh. And then I was not only laughing, but also running to the next room to share my favorite jokes with family members. The antics of these two characters are completely silly and ridiculous, but somehow that works for their personalities. The “troublems” in the title should give you a clue that there’s a lot of odd word combinations, which sometimes works great for the storylines and sometimes not so much. My one complaint was that the format of the book was a little weird. The first half is made up of mini-comics episodes 1-3 pages long, while the second half of the book was a longer continuous story (albeit made of up of smaller episodes). If you can’t stand silly or ridiculous things, you’re probably not going to enjoy this one, but I can see kids totally eating this up (and adults who don’t take life too seriously will enjoy it too). Read my blog disclaimer here. If you are an author, publisher, or publicist who would like to send me a book, please send me an email at shadyglade (AT) mail.com. I am always happy to look into new books. Please read my blog review policy for all the details. 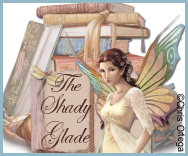 If you'd like to submit a guest blog post to The Shady Glade, I'd love to have you! I will happily accept any guest posts, whether they are reviews, interviews, ramblings, or whatever! Please read my Guest Post policy for full details. If you decide to make a purchase through Amazon.com using the links on this site, a small percentage of your purchase will go towards keeping The Shady Glade running. Alyssa has read 9 books toward her goal of 175 books. Amazon links found here are affliate links. 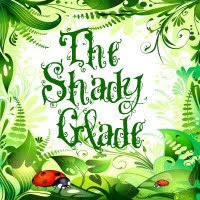 If you click over to make a purchase at Amazon.com using these links, a very small percentage of your purchase will go to help cover the costs associated with running The Shady Glade. Your purchases help cover postage to send out prizes, among other various costs. If you would like to donate in other ways, please contact me at shadyglade(AT)mail(DOT) com.